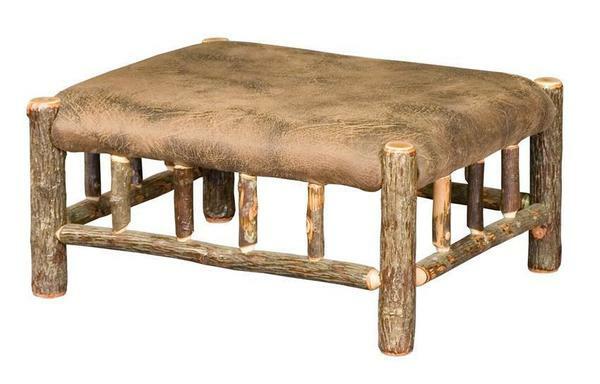 This Amish Rustic Hickory Ottoman is the perfect companion to the Hickory Lodge Sofa, Love Seat, or Lounge Chair. Kick back and relax while being surrounded by the beautiful outdoors right in the comfort of your own home. Choose to have this Amish ottoman upholstered in fabric or leather to meet your personal style preferences. Also choose a finish type to finish off your custom look. We even offer caster wheels so you can glide your ottoman from the love seat to the sofa with ease. The Amish Hickory Lodge Sofa, Loveseat and lodge chair will complete the entire look.